Beginning at 10 a.m. on Wednesday, students at schools across the U.S. and as far away as Australia and Germany walked out of class for 17 minutes to mark the one-month anniversary of the mass shooting at Marjory Stoneman Douglas High School in Parkland, Florida. 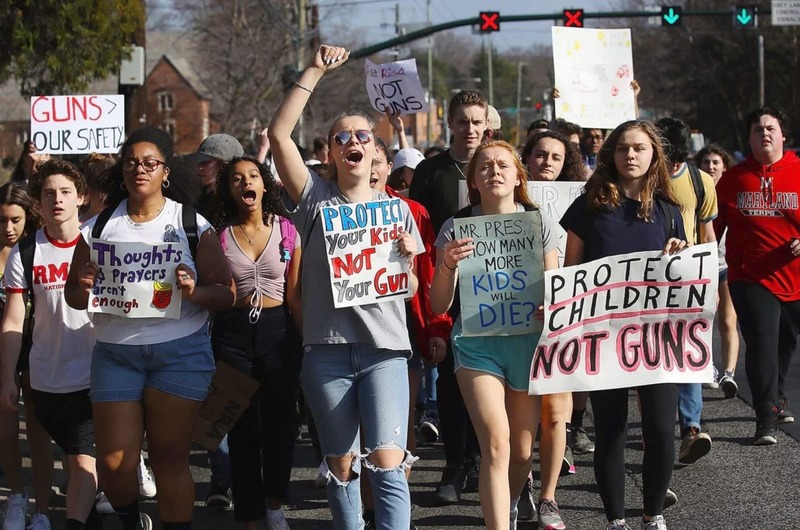 Seventeen people were killed in that shooting, and most of the students participating were protesting for stricter gun laws. One student in New York City held a sign that read “I wanna make it to graduation” while elementary school students in Alexandria, Virginia, held signs with messages like “keep our schools safe.” According to organizers, people at more than 2,800 schools and universities signed up to participate, even as some schools have pledged to suspend students who walk out. This entry was posted on March 14th 2018 at 11:40am/11:40 and is filed under Live News Column 1, Politics. You can follow any responses to this entry through the RSS 2.0 feed.